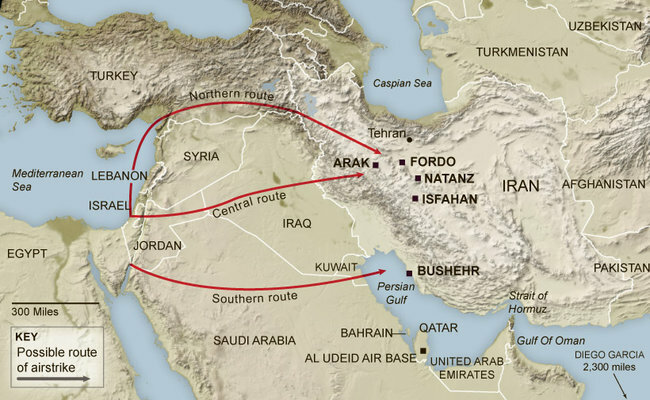 The Middle East and Iran: Is Israel Capable of Successfully Striking Iran's Nuclear Program? Is Israel Capable of Successfully Striking Iran's Nuclear Program? While much of the discussion and analysis of Iran's nuclear program has focused on whether Israel will or will not attack, one key factor to consider is would an Israeli attack even succeed. The attack would surely be a daunting endeavor, with Israeli planes needing to traverse approximately 1,000 miles of territory, much of it hostile. As the map below from the NY Time shows, there are three possible routes for an Israeli attack - Southern, Center and Northern. 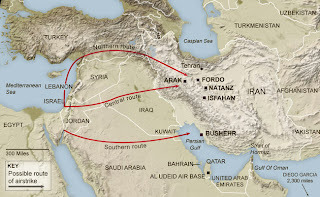 The most likely route would be the Center one flying over Iraqi territory as the country has no air defenses s and the US no longer has any responsibility to defend its skies since its troops have completed their withdrawl from the country. Even than, however, it is estimated that Israel would need at least 100 planes, and they would need to be refueled in the air. There was an excellent article from the NY Times in which a number of American defense officials and military analysys generally believed that an Israeli attack would be difficult if not impossible to pull off. All of this does not mean that Israel would not try to take out Iran's nuclear facilities, only that that all agree this would be an extremely complex operation whose opportunity for success was far from assured.